A popular race route, but it is also a great “Heart of the City” run. There are 2 routes: a 3.3 and a 5 mile loop that follow along the wide city sidewalks. Our route starts in the Mile Square/Wholesale District areas. Start at the corner of Capitol St and Washington Ave, go west to the Indianapolis Zoo in White River State Park, running by the NCAA Hall of Champions and the Indiana State Museum, then north along the White River Trail. For the 3.3 loop, turn right on the New York Street Bridge, to cross the White River, you’ll pass the IU Track stadium and then return to the starting point. 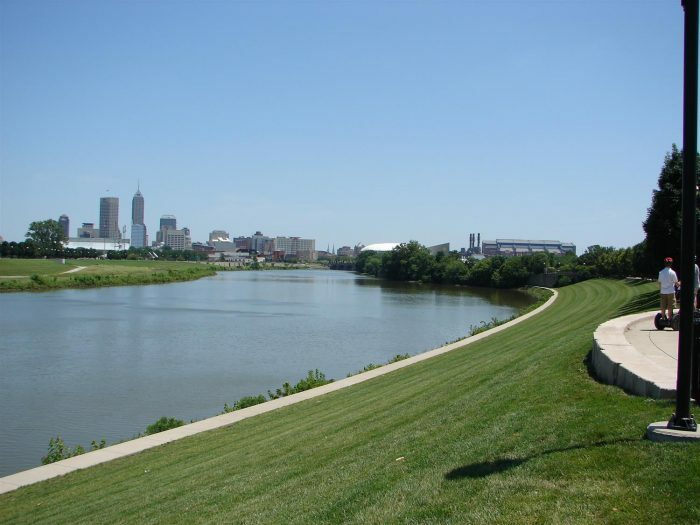 For the 5 miler, turn right on 10th street, past Wishard Hospital and the Canal Overlook, then loop around Monument circle, the city’s center landmark. Walk to the top of the Monument for a 360 degree view of the city skyline from 275 feet up!